Home > Blog > Nutrition > Can Dogs Eat Seafood? 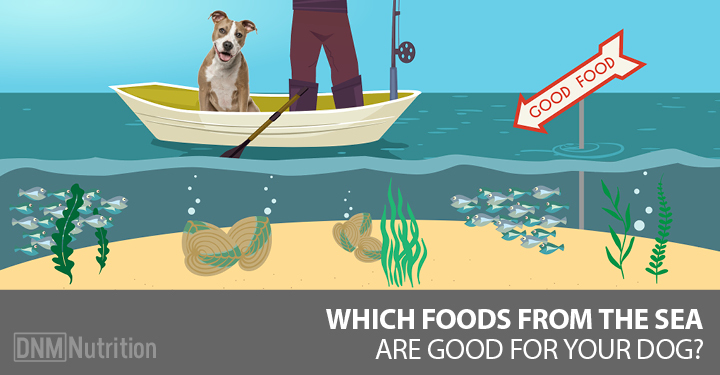 Foods from the sea can be a healthy addition to your dog’s diet … or they can add unnecessary and harmful toxins and heavy metals. Phytoplankton are tiny micro-algae that feed all forms of ocean life. They provide an amazing array of nutrients from essential fatty acids, trace minerals, chlorophyll, antioxidants, and essential amino acids, to protein, carotenoids and vitamins. Phytoplankton also contains high levels of DHA (docosahexaenoic acid) and EPA (eicosapentaenoic acid) Omega-3 fatty acids, which support your dog’s immune system, cognitive function, heart, skin and joint health. Fish get their Omega-3s from phytoplankton too, and that’s why people often feed their dogs fish oil … but keep reading to the red section to find out why you shouldn’t give your dog fish oil for these nutrients. Phytoplankton can help your dog with digestive issues – and because they’re made up of tiny nanoparticles that are absorbed by the mucous membranes (like the gums), they nourish your dog’s cells without having to be digested first. Phytoplankton also contains superoxide dismutase (SOD) which is a powerful antioxidant that can help prevent cancer, heart disease, eye problems and immune system issues. Look for a source of phytoplankton that’s sustainably grown on land with sunlight, free of radiation and heavy metals, non-GMO (genetically modified) vegan, free of fillers and watered with filtered ocean water. As long as your phytoplankton doesn’t contain fillers, you’ll only need a tiny amount – 1/16 tsp per day for any size dog. Green lipped mussels come from New Zealand waters and they’re another rich source of Omega fatty acids and minerals, as well as vitamins, amino acids, antioxidants and enzymes. They’re a natural source of glycosaminoglycans (GAGS), which are the main components of cartilage and synovial fluid found in the joints. Studies have shown them to relieve discomfort and inflammation in dogs (and people!) suffering from arthritis. They support joint mobility, cartilage maintenance, cardiovascular health and help maintain healthy skin too. You can buy green lipped mussel powders for dogs. Make sure the product you buy is cold extracted. Heat processing will destroy the nutrients. Follow the dosing instructions on the package … or give about 15 mg of powder per lb of your dog’s body weight per day. If your dog has severe inflammation, you can double the dose for the first two weeks and then reduce the dose to the recommended level. Another way to give your dog green lipped mussels is to buy freeze-dried treats and give 2 mussels for every 10 lbs of bodyweight per day. Again, make sure the product you buy hasn’t been heat-treated. Kelp is a seaweed that comes from cold water areas like Iceland or Norway and is usually dried to a green powdered supplement. Kelp is a rich source of vitamins, as well as minerals like calcium, magnesium, potassium, phosphorous and 17 amino acids. Kelp also contains abundant trace minerals. Kelp contains sodium alginate that’s said to help rid the body of heavy metals and radioactive elements. Buy a product made for dogs and follow the dosing directions on the packaging. A good guideline is about ¼ tsp per 25 lbs of body weight per day. Fish in general is a great source of protein, calcium, selenium, niacin and Omega-3 fats for your dog. In fact, giving whole fish is a much better way to give your dog Omega-3 fatty acids than fish oil, which is very unstable and can easily become rancid. But larger fish that are higher up the food chain can be contaminated with toxins like mercury and PCBs (carcinogenic chemicals called polychlorinated biphenyls), and should be avoided (read more in the Red section below). The solution is to give your dog the smaller fatty fish like sardines, smelts, herring, mackerel and anchovies. It’s a good idea to freeze them for two weeks before feeding, to avoid any parasites that may be in some fish. You can feed these fish whole and raw two or three times a week. Depending on your dog’s taste, give them either thawed or still frozen (some dogs prefer their fish crunchy). You can also give your dog canned sardines (preferably packed in water without added salt). For a 40-50 lb dog, give ¼ of a 3.75 oz can of sardines per day along with other foods. You’ll find various different kinds of seaweeds in the form of flat dried sheets, in grocery or health food stores, often in the Japanese section. These seaweeds are all very high in minerals as well as protein, fiber, vitamins and amino acids. Look for names like dulse (sea parsley), kombu (horsetail kelp), nori, wakame and Irish moss. You can toast or bake the sheets and crumble them over your dog’s food for a nutritious topping that can support thyroid health, liver and kidney function, glandular and lung support as well as soothing the gastrointestinal system. Spirulina is full of powerful nutrients and contains high levels of chlorophyll as well as more than 50 percent protein. Like many other foods from the sea, it’s a rich source of vitamins, minerals, amino acids and Omega-3 fatty acids, as well as enzymes and trace minerals. Spirulina can help manage inflammation, prevent cancer, support the immune system, improve gastrointestinal health, and treat bacterial and yeast overgrowth, as well as radiation exposure. Spirulina is a remarkable super-food, but poor quality spirulina can contain contaminants such as heavy metals (one study found lead, mercury, cadmium and arsenic in more than 25 spirulina products they tested). So before you pick a brand, do your research. Check for a seal showing a third party certification from the NSF (National Sanitation Foundation) or USP (US Pharmacopeial Convention). Also ask the company for a Certificate of Analysis (COA) describing their product quality and origin. Make sure you buy a 100 percent organic product, without any additives, preservatives, fillers or colorants. In theory, your dog should be able to eat shellfish like shrimp, clams, mussels or oysters. These creatures are nutrient dense because they live in mineral rich waters. Oysters, clams and mussels are bivalves (with hinged shells) that are generally rich in vitamin B12, protein, iron, zinc, copper, calcium, phosphorus and selenium, as well as Omega-3 fats. Because bivalves are low on the food chain, they are low risk when it comes to heavy metal contamination. However, because they are filter feeders, they can take up toxins from toxic microalgae such as dinoflagellates – tiny organisms that “bloom” in the summer, producing a neurotoxin that affects muscle function and can cause paralytic shellfish poisoning (PSP). Factors like temperate waters and seasons (late spring to early fall – the reason you’re not supposed to eat oysters in months without an ‘r’ in them) and weather conditions can affect the level of toxins in seafood. If you want to feed bivalves to your dog for the nutrients they provide, make sure they come from clean, cooler waters and suppliers who test their products for contamination. Shrimp is a low calorie form of protein, and if you can get fresh, wild shrimp, it’s fine to share it with your dog (mine love eating the tails!). But most shrimp in grocery stores are imported from a variety of countries (and most packaging doesn’t tell you where it’s from) and is farm-raised. This is a problem because shrimp farmers use antibiotics, disinfectants and pesticides to prevent shrimp disease. So imported shrimp commonly contain harmful chemicals. Shrimp labeling is notoriously unreliable (at least 30% is misrepresented – even as to whether it’s wild or farm raised), so buy your shrimp from a trustworthy source. In an effort to find a source of Omega-3 essential fatty acids, squid oil is recently coming to the fore as a possible alternative to fish oils. Squid oil contains high levels of EPA (great for skin and coat as well as nervous system and cognitive function) and DHA (has excellent anti-inflammatory effects). The squid population is increasing and they appear to be highly adaptable to changing ocean conditions, meaning that sustainability is not an issue. Squid doesn’t have bones (which can absorb radioactive elements like strontium) and is low on the food chain. Squid tests show it’s free of contaminants, especially when sourced from Scandinavian waters. However, all oils are unstable and can oxidize and turn rancid quickly once opened. Make sure your source of squid oil is micro-filtered to eliminate heavy metals and toxins, tested for contaminants, and comes in a dark glass bottle. Refrigerate it after opening and use it within 90 days. Give your dog ¼ tsp daily per 20 lbs of body weight. Giving your dog fresh salmon can be a great way to provide him with Omega-3s as well as vitamin D. It’s an excellent source of protein and is rich in minerals like magnesium, potassium and iron. Also, most dogs love eating salmon, which you can feed raw. Salmon can benefit skin, coat, immune system, cognitive function and has anti-inflammatory effects. But there are several things you need to be cautious about in feeding salmon to your dog. First of all, don’t feed farmed salmon at all. Salmon farms use large volumes of antibiotics to prevent disease. They’ve also been shown to contain high levels of contaminants like PCBs (polychlorinated biphenyls), which are known to be cancer-causing chemicals. Also now, genetically modified (GMO) salmon are being produced. While the US Food And Drug Administration (FDA) claims GMO salmon is safe, there have been no studies conducted on the long term effects of eating GMO salmon. GMO salmon is also unlabeled so you and your dog could be eating it unknowingly. So always make sure you buy wild salmon. Just be mindful of salmon poisoning. It comes from a parasite called Neorickettsia helminthoeca. This parasite is typically found in Pacific salmon, and while eating salmon doesn’t make bears or raccoons sick, it can make dogs ill and can be fatal if not treated promptly. Freezing salmon for two weeks before feeding it should eliminate these parasites; but be careful if you’re out for a hike in the Pacific Northwest and your dog manages to scavenge dead salmon. Fish oil – whatever kind of fish it comes from – has long been popular as a supplement for dogs. It provides Omega-3 essential fatty acids like DHA and EPA that support a healthy immune system, reduce inflammation, benefit skin and coat as well as cognitive function. Unfortunately the good news ends right there … or, right when you first open the bottle of fish oil (or even before you open it, in some cases). Fish oil is extremely vulnerable to oxidative damage. When Omega-3 fat particles are exposed to air, they break down into smaller compounds like MDA (malondialdehyde) and create oxygen-containing molecules called free radicals. Both MDA and free radicals cause premature aging and disease because they damage proteins, DNA and other cellular structures. This is called oxidative stress and it causes inflammation in the body and can lead to chronic health problems, including gene mutation and cancer. Fish oils can also contain heavy metals like arsenic, mercury, cadmium and lead, which can damage the nervous system and cause certain cancers as well as liver and kidney damage. Other contaminants like PCBs and dioxins can also be found in fish oils, causing an array of disorders including nervous and immune system issues, endocrine and reproductive disorders, skin problems and even some types of cancer. If you still want to feed fish oil, make sure you ask your supplier for a Certificate of Analysis (COA) showing it’s been tested for contaminants. Buy an oil that’s in a dark colored glass container, keep it refrigerated and use it quickly. Every time you open the bottle, there’s more oxidation and more risk of the oil causing health issues. First of all, sustainability is a huge potential issue. Many ocean dwellers, including whales, seals, penguins, squid and fish rely on krill for food. Companies that sell krill oil will usually tell you their harvesting is sustainable and that there’s plenty left for the creatures who need it to survive. The Marine Stewardship Council monitors these claims and you can verify them at the MSC website. (This is also a good place to check that other fish you’re buying is not endangered). Second, while krill oil is more stable than other fish oils, it’s still susceptible to oxidation once you open the bottle. Krill oil does contain a natural antioxidant – astaxanthin – that prolongs the shelf life of krill. However, astaxanthin itself degrades very quickly, so its protective qualities are diminished over time. Tilapia’s a very popular fish because of its mild flavor and relatively low cost– in fact it’s the fourth most consumed seafood in the US, after shrimp, tuna and salmon. A high percentage of farmed tilapia comes from China where poor quality feeds are often used and fish are grown in overcrowded muddy ponds. This means that farmed fish usually contain high levels of pesticides and antibiotics used to prevent disease. On the plus side, the Environmental Working Group (ewg.org) considers tilapia a safe choice in terms of mercury contamination. If you want to feed tilapia, check first whether your tilapia has an Aquaculture Stewardship Council (ASC) seal. The ASC audits and certifies tilapia farms that have appropriate production standards. Only about 15 percent of tilapia available in the US carries this seal. It’s safest to avoid giving your dog any larger fish. Fish to avoid include tuna, walleye, marlin, swordfish shark, sturgeon and bluefish. Mercury gets into our waters due to industrial waste run-off into lakes, rivers and the ocean. This means that mercury is present in a lot of fish, but it’s found at much higher levels in larger predator fish higher up the food chain, as they eat other smaller sea creatures. Mercury “bioaccumulates” in these predators, so eating larger fish can lead to a number of health issues. Mercury toxicity is serious and it’s increasing. It accumulates in our bodies over time and causes problems ranging from nervous system disorders to endocrine issues, reproductive problems and accelerated aging. And if you’re giving your dog canned tuna (or eating it yourself), be aware that the mild tasting white albacore tuna is almost three times higher in mercury than skipjack tuna, used in most canned light tuna. If you want to feed canned fish, canned salmon from Alaska is relatively low in contaminants.